Simply Southern Girl: Monograms are better on pumpkins???? Monograms are better on pumpkins???? She of course forwarded the link my way immediately, as she knows how fond I am of monograms.. I suppose great minds think alike becuase look what I had created to celebrate the season! I used a pumpkin I picked up from Tomato Land, a bag of 8mm flat backed glue on rhinestones. I love the finished product, such a different take on Halloween! Everything is better with a monogram right?!?! 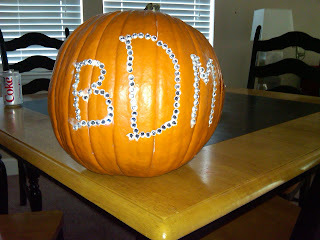 ps.. i need to take another photo of the final pumpkin.. as the rhinestones are still wet on this one. put it on the stand where the dying ivy is and then take a picture - cute!